In generations gone by, in times of struggle and strife, people often made their own ornaments out of old magazine cut outs, leftover pieces of tin and scraps of fabric and wool. As many people face hard times this holiday, there are still many ways that you can add some Christmas cheer to your home very inexpensively. Finding the time to create these simple felt ornaments with family and friends will create longer lasting memories than twinkly trinkets from the department store. 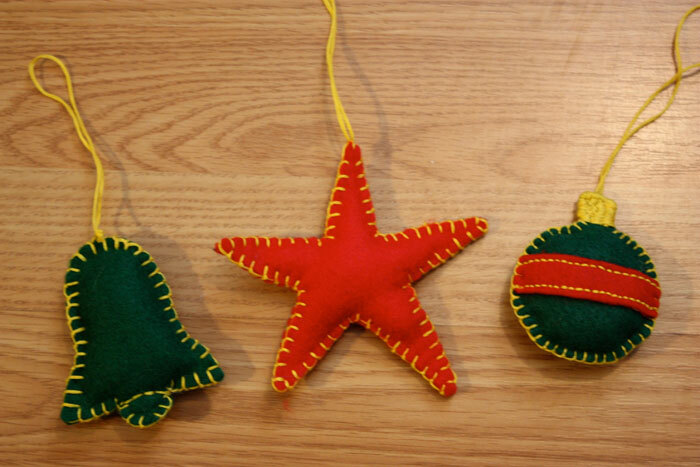 This is a great simple craft that is also a fun way to teach children or beginners how to stitch, and adds a homemade touch to your tree. My love of small felt ornaments began when I found these delicate little felt mittens that my great grandmother made. To think that her hands created these whimsical tiny pieces was more important than any store bought decoration. Using the original mittens as a pattern, I decided to make some of my own, and now I’m going to share the steps with you. First cut a mitten shape out of cardboard. Keep in mind that the smaller it is, the more difficult it will be to stitch around, so if this is a project that you are making with children, make the mitts larger. For every pair of mittens you will need 4 pieces of felt. Place 2 of the felt pieces together, and using embroidery floss, do a blanket stitch around. When you are 3/4 of the way around the mitten, fill it with polyfil, or felt scraps, and then stitch the rest of the way around. Continue with the other mitten. Using a piece of embroidery floss, tie the two mittens together. Using the same principles, try out different shapes. Bells, Stars, Ornaments, Snowmen, Santas. There are no limits. You can add glitter or stitch lettering to personalize them. If you are doing this with children and want to make it easier for them, sew the basic shapes on a sewing machine first, and have them do the blanket stitch around the edge to practice. 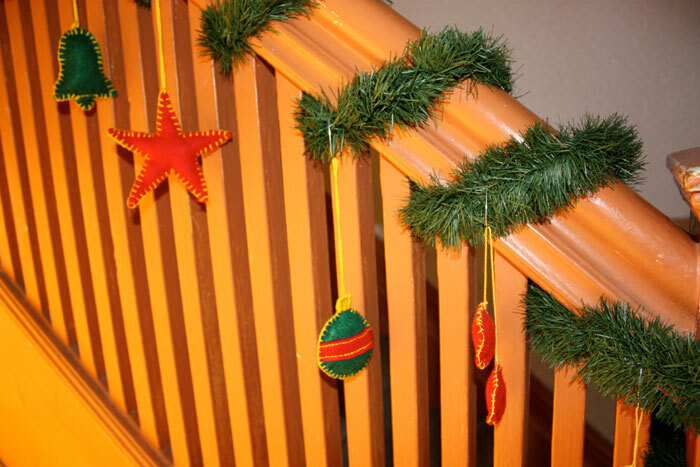 I hung the shapes on the garland on the staircase up to my apartment. It will be a nice reminder every evening when I come home. And there you have it. 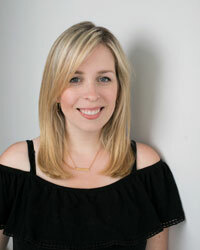 A simple easy craft that you can make this holiday season. 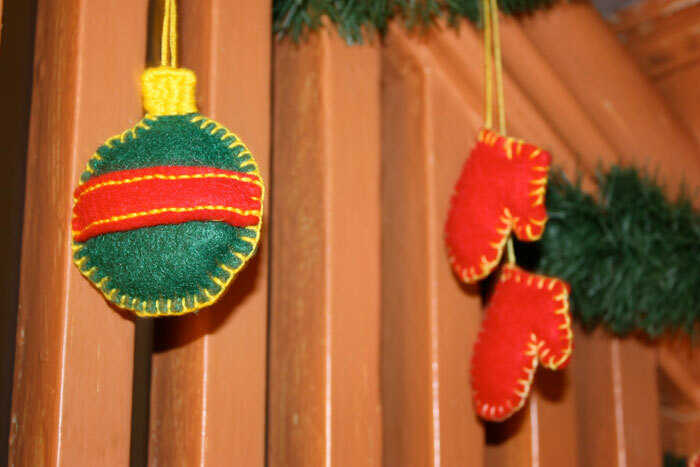 Do you have any homemade ornaments that you like to make? I’d love to hear about it. The mittens are my favorite. I love handmade ornaments.